While Andover’s Harriet Beecher Stowe had awakened the conscience of the nation before the Civil War with “Uncle Tom’s Cabin”(the best-selling book of the 19th century), after the Civil War Andover’s Elizabeth Stuart Phelps helped soothe the anguish of the nation with a novel that would become the 2nd best-selling book of the 19th Century. 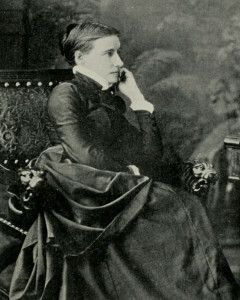 Born as “Mary Gray Phelps” in 1844, she was the daughter of Austin Phelps, a Professor of Sacred Rhetoric at the Andover Theological Seminary and Elizabeth Stuart Phelps, a published author herself. When “Mary Gray” was just eight(8) years old, she confronted death for the first time upon her mother’s passing in 1852. She then took the name of her mother and thereafter was known as Elizabeth Stuart Phelps. Less than four (4) years after her mother died, Phelps’ step-mother (her mother’s sister) also died. Just as these deaths had a profound effect on Elizabeth, her upbringing in Andover did as well. As a young woman, Phelps grew to know famous American writers such as Ralph Waldo Emerson and Harriet Beecher Stowe, as well as the renowned professors at the Andover Theological Seminary, then one of the leading institutions of its kind in the country. Phelps’ literary career began soon after the outbreak of the Civil War when at the age of nineteen (19) she wrote a short war story entitled “A Sacrifice Consumed” which, much to her surprise, Harper’s Magazine published. By the end of her life she had written more than fifty-five (55) different works of fiction. Also, during her adult years, Phelps was an outspoken proponent for the equality for women. She is best known for her novel “The Gates Ajar” which she wrote at her father’s home at 189 Main Street in Andover, now known as the “Phelps House.” The novel, begun in 1864 and published in 1868, became an international best seller and was translated into several languages. It focused on the loss felt by a young girl when she learns her brother has died in the Civil War. The young girl, Mary Cabot conjures a heaven much like earth and one focused not on God but on reunion with her dead soldier brother. The book met at first with controversy given it’s religious views, but then met with incredible commercial success since it dealt directly with the great personal loss that nearly every American had suffered during the Civil War. In “The Republic of Suffering” Drew Gilpin Faust writes that “The Gates Ajar” captured the public’s imagination since it portrayed “a more perfect Earth: Victorian family and domesticity are immortalized, and death all but disappears.” Phelps had provided comfort to a nation devastated by the War’s slaughter. At that time, it will be remembered, our country was dark with sorrowing women. The regiments came home, but the mourners went about the streets. The Grand Review passed through Washington; four hundred thousand ghosts of murdered men kept invisible march to the drum-beats, and lifted to the stained and tattered flags the proud and unreturned gaze of the dead who have died in their glory. Our gayest scenes were black with crepe. The drawn faces of bereaved wife, mother, sister, and widowed girl showed piteously everywhere. Gray-haired parents knelt at the grave of the boy whose enviable fortune it was to be brought home in time to die in his mother’s room. Towards the nameless mounds of Arlington, of Gettysburg, and the rest, the yearning of desolated homes went out in those waves of anguish which seem to choke the very air that the happier and more fortunate must breathe….. I do not think I thought so much about the suffering of men, the fathers, the brothers, the sons bereft; but the women, the helpless, outnumbering, unconsulted women; they whom war trampled down, without a choice or protest; the patient, limited, domestic women, who thought little, but loved much, and, loving, had lost all, to them I would have spoken. At the end of her life, Elizabeth Stuart Phelps wrote glowingly of the Andover of her childhood. Recognizing there were times when she found it stifling to live in a world dominated by male professors on “the Hill,” she described Andover as a “gentle” place in which she ultimately was allowed to flourish. She died in 1911.